Medium: lithograph (after the drawing). Beautifully printed in blue ink in 1947 by Draeger Freres; from the unsigned edition of 950 on Rives wove paper for "Pierre a feu / Les miroirs profonds", published in Paris by Maeght. The total sheet measures 9 1/2 x 8 inches (240 x 205 mm). Plate-signed by Henri Matisse, not signed by hand. Medium: lithograph (after the drawing). This piece is from a rare suite of lithographs issued by the Pierre Matisse Gallery during the 1950's. The total sheet measures 10 1/2 x 7 3/4 inches (270 x 200 mm). Signed in the plate (not signed by hand). Medium: lithograph (after the drawing). 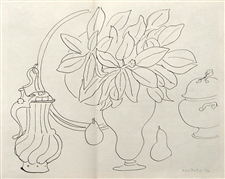 This piece is from a rare suite of lithographs issued by the Pierre Matisse Gallery during the 1950's. The total sheet measures 10 1/4 x 7 3/4 inches (263 x 195 mm). Signed in the plate (not signed by hand). Medium: lithograph (after the drawing). This piece is from a rare suite of lithographs issued by the Pierre Matisse Gallery during the 1950's. The total sheet measures 10 1/4 x 7 3/4 inches (262 x 195 mm). Signed in the plate (not signed by hand). There is another image printed on back, as issued. Medium: lithograph (after the drawing). This piece is from a rare suite of lithographs issued by the Pierre Matisse Gallery during the 1950's. The total sheet measures 10 1/2 x 7 3/4 inches (268 x 200 mm). Signed in the plate (not signed by hand). Medium: heliogravure (after the drawing). Published in Paris in 1920 in an edition of 1000 and printed on Hollande paper. Image size: 9 1/2 x 6 1/2 inches (240 x 160 mm). Signed in the plate (not by hand). 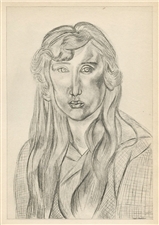 Henri Matisse lithograph "Aquarelles - Dessins"
Medium: lithograph (after the watercolor). This lithograph was the cover of a rare exhibition catalogue issued in Paris by the Jacques Dubourg Gallery in 1962. The total sheet measures 8 1/2 x 6 1/4 inches (220 x 157 mm). Signed in the stone with the Matisse monogram signature (not signed by hand). Medium: heliogravure (after the drawing). Printed by Mourlot Frères on Arches paper in a limited edition of 500 and published in Paris in 1941 by the Galerie Louis Carré for a rare exhibition catalogue. The image measures 9 1/4 x 11 3/4 inches (232 x 300 mm). There is printed text on back of the sheet, as issued. 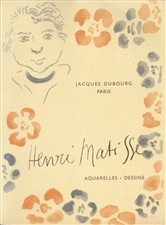 Signed by Henri Matisse in the plate (not by hand). Condition: there is a bit of foxing to the paper. Also, this print was issued as a folded sheet so there remains a center crease (left of center) with pinholes (from the original binding stitches) along the fold.